All of us at the LMMI were deeply saddened to hear about the passing of our dear friend, John Macneill. Sending Jennie Macneill and her family our sympathies. Mary Beth Cavert from the L.M. Montgomery Literary Society wrote this lovely obituary about John and I share it with you now. 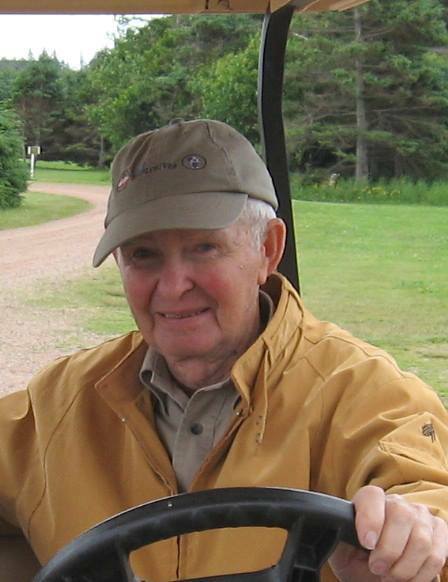 We are deeply pained to share the loss of a good and gentle friend, John Macneill, of Cavendish, Prince Edward Island. John was the grandson of Montgomery's Uncle John (who lived next to her grandparents and the house where the author lived). John's father, Ernest Macneill, was Montgomery’s cousin. John and his wife Jennie are the family members responsible for restoring the grounds and landscape where Montgomery grew up and wrote Anne of Green Gables. When John and Jennie read Montgomery's journals and learned how much she loved the Homestead, they worked for three years to clear the landscape around the foundation of the old home. They restored the grounds with an authenticity which allows Montgomery fans to experience the sense of place that the author herself felt so keenly. John and Jennie have been devoted and tireless contributors to their community and church all their lives. The flowers that you see planted around the church and in the Cavendish cemetery in past years have been their handiwork. We mourn this loss to the Montgomery community and personally and extend love to his family and friends, especially to Jennie and their children.